One of the most important differential characteristics is gear ratio. Оtherwise gear ratio of the final drive. Also BMW LSD diff ratio. The final drive in the vehicles use the structure of single-stage bevel gearbox with hypoid gears(look hypoid gear). 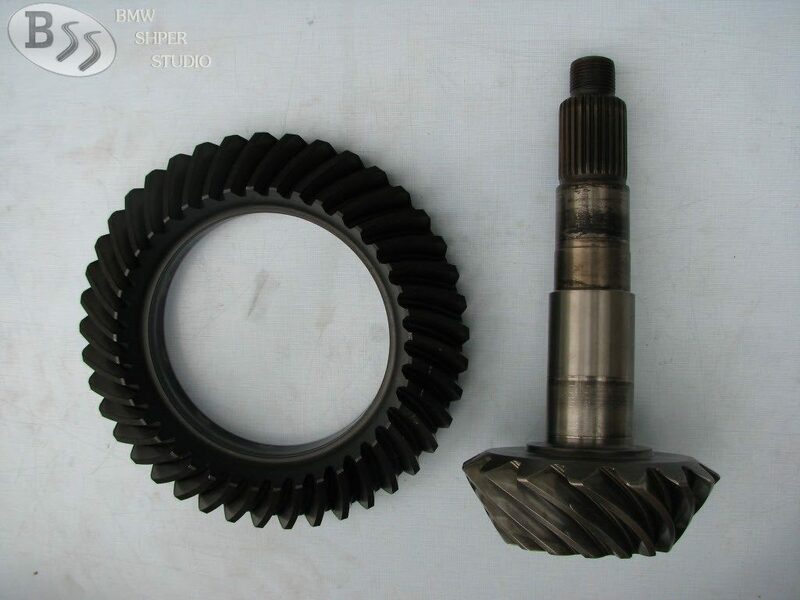 Simply the final drive consists of two gears, called pinion and crown. They are also called gear pair because each particular pinion is manufactured with relevant crown and do not work with another. Torque from the engine is converted into the gearbox and it is transmitted to the drive shaft, which rotates the pinion of the final drive. Pinion transmits the torque to the crown, as this is a change of direction by 90 degrees. Both gears have crossed axes. The crown is fixed to the differential case and turns it around. Right out there a torque is transmitted to the satellite gears, and they transmit it to the planet gears. They are linked to output shafts, which at the other end attached to the wheel hubs. If necessary the differential case distributes torque to both wheels in a certain difference. While driving on a straight ahead, the differential case really do not work and torque is distributed equally between the two wheels. The final drive specific requirements are compact design with minimum possible size of the crankcase, small loads on shafts and bearings, noiseless, high efficiency, durability and simple maintenance. The disadvantages are relatively complicated construction and increased noise due to inaccurate manufacturing and assembly. Small ratios increase the maximum speed Vmax and are called “long” and bigger adding acceleration and called “short” because the gearbox shifts quickly. Accordingly, we have a reduction of Vmax. Numbers less than 2.79 are primarily used for diesel engines, due to the lack of revs and excess torque. So at any speed we will reduce the Vmax with GRC% and increase the torque to the tires with the same GRC%. An example of changing the gear ratio. This reduces the maximum speed in each gear with 10.2%, but added 10.2% more torque to the rear wheels. Which will surely be noticeable. I would recommend even shorter Diff, but determining the proper gear ratio depends on the application of the car, as well as individual wishes of the driver. Just a word about fuel consumption. After changing the gear ratio, fuel consumption did not change in a predominantly urban driving. Adverse changes will occur when driving on a highway.